Many people keep important documentation such as birth certificates and medical records in their storage spaces. Some also keep information on finances in storage. It’s critical to keep the data in these documents protected. And so a storage plan should be devised. 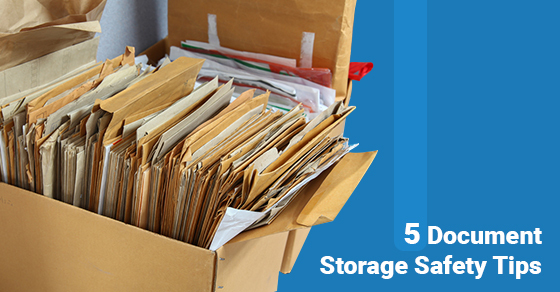 To help guide the planning process for storing important documents, here are five tips for keeping documents safe. If you’re storing documents such as passports and birth certificates, it’s critical the storage facility has a high-level security system. Review the company’s security precautions ahead of time and then only choose a firm with a comprehensive security infrastructure in place. Climate control is an important element of maintaining document quality. Moisture and humidity can have a significant impact on documents, so try to ensure that the facility you select offers pinpoint climate control. The boxes in which the documents are stored should be raised off the ground to avoid contact with moisture and other elements. Keeping the document storage boxes elevated in this way will ensure complete protection for the documents over the coming years. Speak with the storage company about pallets and other elevating devices they might be able to offer as part of their storage services. One of the leading concerns with the storage of any important documents is moisture. Water can cause irreparable damage to the documents and may make the data they hold unusable in the future. To resolve this issue, it’s important to use airtight containers when storing documents. The containers should be completely sealed and should be checked on a regular basis for potential damage that might allow moisture inside. A common mistake when storing important documents is not labelling the boxes properly. This can lead to errors in how the documents are handled and may mean that important documents are lost when moving from one space to another. Labeling is a critical element of the document storage process. Our experts are available now to help guide you in keeping your stored documents safe. To learn more on this process, contact our office team today and speak with one of our trusted storage experts.